Over the last few decades of traveling around the country documenting broadcast facilities, I’ve learned to build in extra time when I’m visiting a new market for the first time…usually. Every once in a while, though, the demands of a tight schedule mean I have to move much more quickly through a town than I’d like. And so it was in Peoria, Illinois in the summer of 2012, when I found myself with a neat market full of studios and towers and just a few hours to try to see as much as I could. Fortunately, Peoria is a fairly compact city, at least from a broadcast perspective. 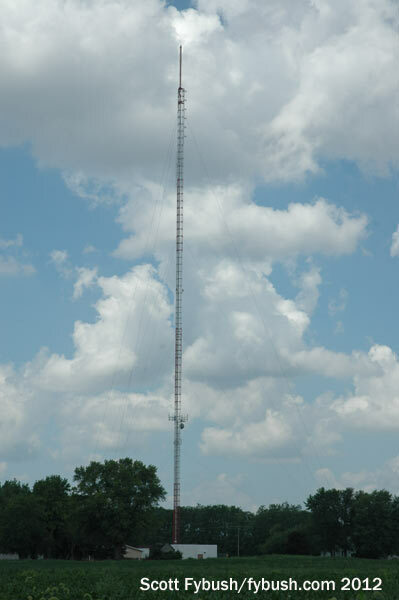 Most of its AM sites are concentrated south of the city and east of the Illinois River, with most of the TV and FM sites a little closer to town, also on the east side of the river. We began our Peoria visit, though, up on the north side of the city itself, which hugs the west bank of the river. Heading up North University Drive, one of the main north-south drags on the north side, we come to the office park that’s home to the Advanced Media Peoria cluster: ESPN outlet WZPN (96.5 Farmington), “Kiss” top-40 WPIA (98.5 Eureka), AAA WWCT (99.9 Bartonville) and “Jack FM” WHPI (101.1 Glasford). 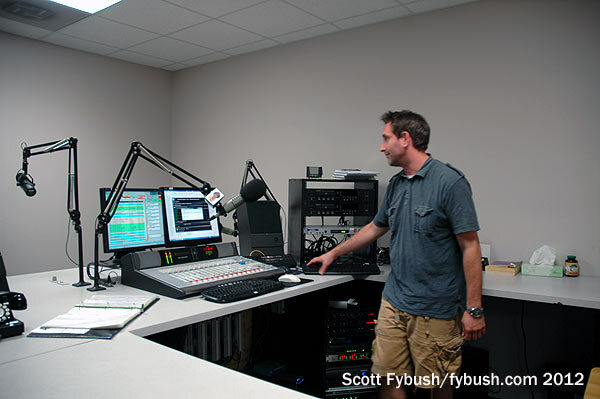 This is a fairly new facility, and after morning drive, a lot of what comes out of these rooms is tracked, but there’s plenty of space for these locally-owned stations to operate from. 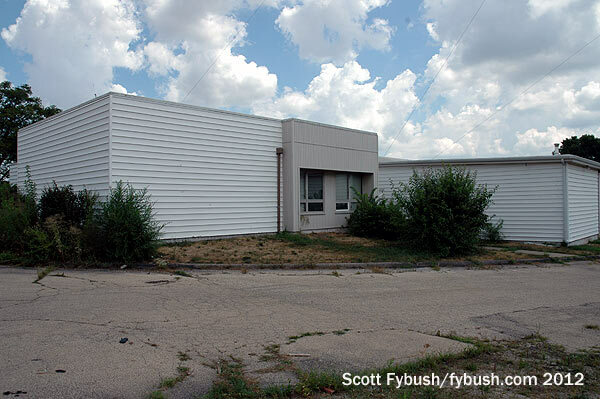 Not far down University, we find the former supermarket that’s been the home to CBS affiliate WMBD-TV (Channel 31) since the 1970s. WMBD was the last of the “big 3” stations to sign on here back in 1958, closing a chapter of TV history in which Peoria ended up as an all-UHF market. Channel 8 was originally allocated here, and even had a construction permit at one point for a WIRL-TV, but a shuffling of the dial moved that VHF channel westward to become a third allocation in the Quad Cities market, leaving just one commercial VHF (WCIA channel 3 over in Champaign) and a patchwork of UHF allocations that eventually shook out into the sprawling Champaign-Decatur-Springfield market. While WCIA’s ownership eventually bought sister CBS outlet WMBD-TV, Peoria remained its own separate market all along, and still is today. 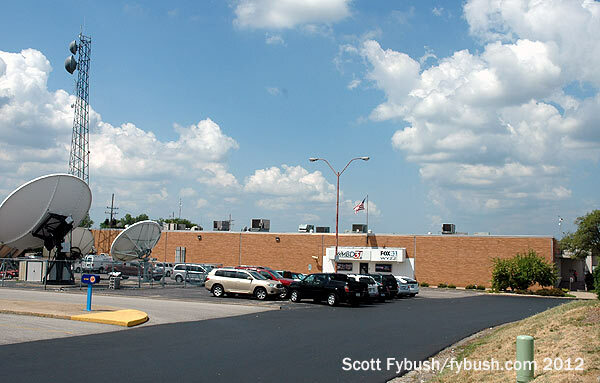 WMBD-TV remains co-owned with WCIA under Nexstar, and for now Nexstar also operates Bloomington-licensed Fox affiliate WYZZ (Channel 43) from here for Sinclair. Unlike much of the rest of central Illinois, there’s real terrain here in Peoria, and as we head toward downtown we navigate streets that slope down toward the river and Peoria Lake, where the river widens dramatically alongside downtown. Right by the water’s edge and just beneath I-74 as it bridges over the lake is the cluster studio that was changing hands from Townsquare to Cumulus just as we were driving through town. In here are top-40 WZPW (92.3 Peoria), classic rock WGLO (95.5 Pekin), country WFYR (97.3 Elmwood), rocker WIXO (105.7 Peoria) and, somewhat incongruously, religious WVEL (1140 Pekin). 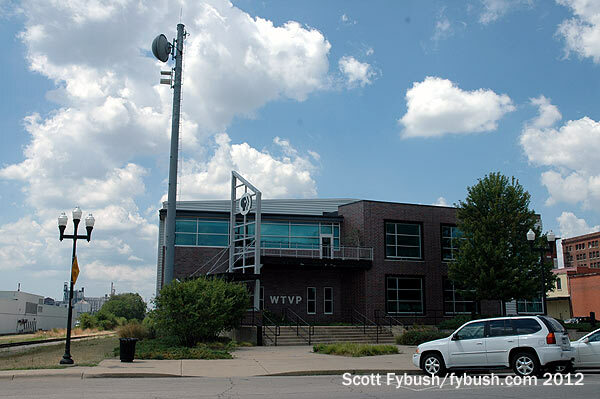 Just a few blocks to the south along the river is the studio building for public station WTVP (Channel 47), which survived a brush with financial oblivion a few years ago to keep on serving the region. 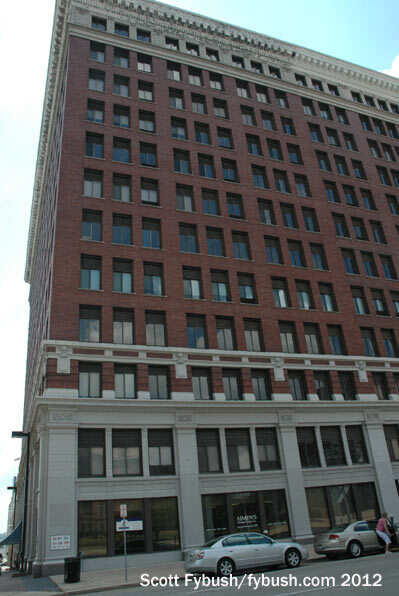 Right in the heart of downtown at 212 SW Jefferson (also known as 331 Fulton Street, the address around the corner), we find the old Majestic Theater, which was WMBD-TV’s original home and which still houses its former radio sister stations. Peoria’s first radio station signed on back in 1927, taking its callsign from the local brag about the “World’s Most Beautiful Drive,” a stretch of Grandview Drive overlooking the river. 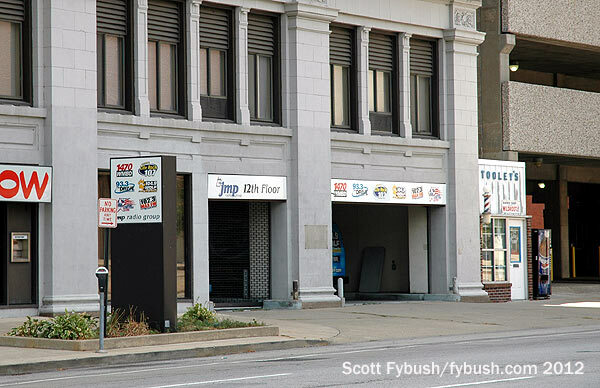 Today, WMBD (1470) is a talker owned by L&L Broadcasting, and its studios upstairs in the old theater building also house longtime sister station WPBD (93.3, “the Drive”) and more recent additions – oldies WIRL (1290), AC WSWT (106.9), classic rock WDQX (102.3 Morton) and country WXCL (104.9 Pekin). From downtown Peoria, we cross the river to East Peoria and adjoining Creve Coeur, which has lots and lots of terrain that steeply climbs the bluffs above the east bank of the river. 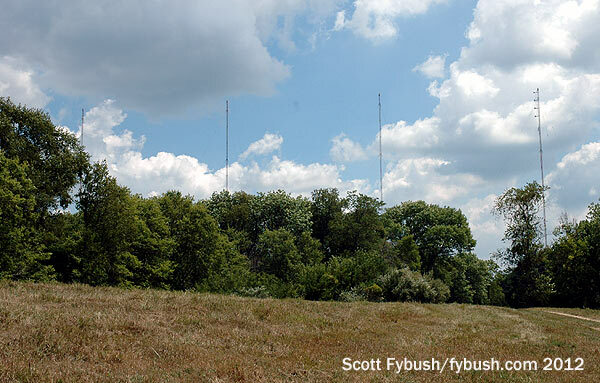 Up at the top of one of those bluffs is the tower and former studio of Peoria’s channel 19. The second station in town, channel 19 signed on in 1953 as WTVH, carrying ABC and eventually CBS after the latter network realized there wasn’t going to be a channel 8 in town after all. 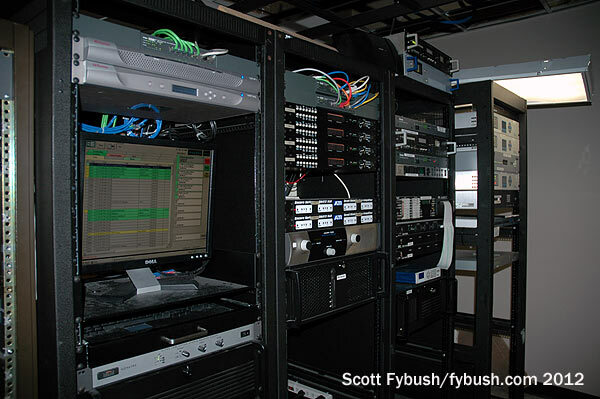 In 2009, then-owner Barrington Broadcasting struck a deal to put WHOI’s operations in the hands of Granite’s market-dominating NBC affiliate, WEEK-TV (Channel 25). 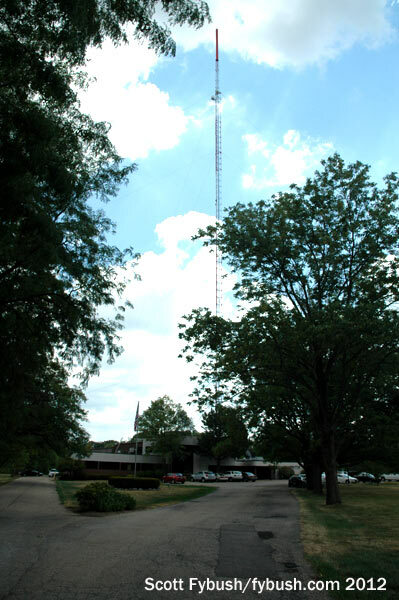 The deal (reciprocated in Syracuse, where Barrington’s WSTM began operating Granite’s CBS affiliate, ironically enough named WTVH) moved WHOI’s studios from Creve Coeur over to the East Peoria studio/office facility used by WEEK and its My Network sister, WAOE (Channel 59), combining both stations’ news operations into a single newsroom. 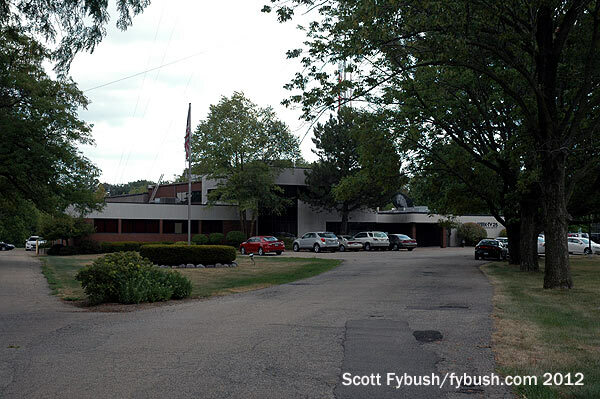 As for WEEK, it’s the oldest and most stable TV station in town, having signed on earlier in 1953 from this very site on Springfield Road as an NBC affiliate. Back then it was on channel 43, but it moved down the dial to channel 25 in the early 1960s. For a time, it also ran a satellite, WEEQ-TV (Channel 35), up north in La Salle; that signal was eventually moved into the fringes of the Chicago market as TBN’s WWTO. Last year, Sinclair bought out Barrington, and that will bring a big shakeup in TV here when the current shared-services agreements expire in 2017: Sinclair is expected withdraw WHOI from its deal with WEEK/Quincy and will also pull its existing station in town, Fox affiliate WYZZ, out of its deal with WMBD-TV/Nexstar. Will the FCC’s shakeup of TV JSAs change those plans? It’s too soon just yet to know, but it’s a good bet the TV dial will look very different here in a few years. The I-474 corridor that cuts through East Peoria right next to the WEEK site also runs past several other TV and FM towers in the vicinity. 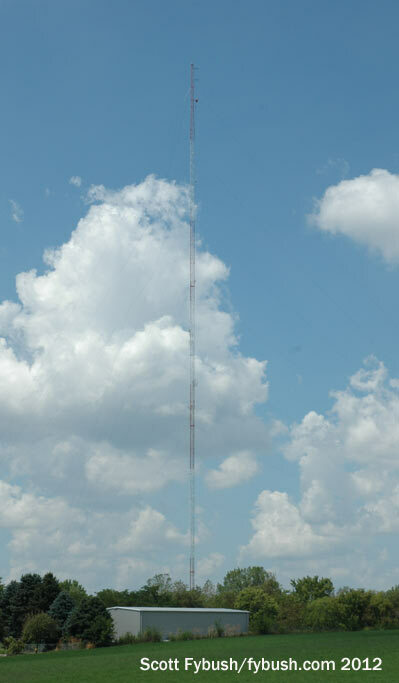 WMBD-TV (Channel 31) and WPBG (93.3) sit right at the junction of I-74 and I-474, a little to the east of WEEK. 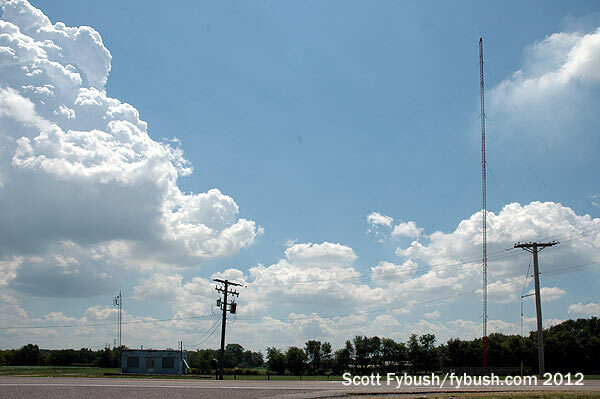 WWCT (99.9) and WGLO (95.5) share a tower south of WEEK at the intersection of Springfield Road and Muller Road. 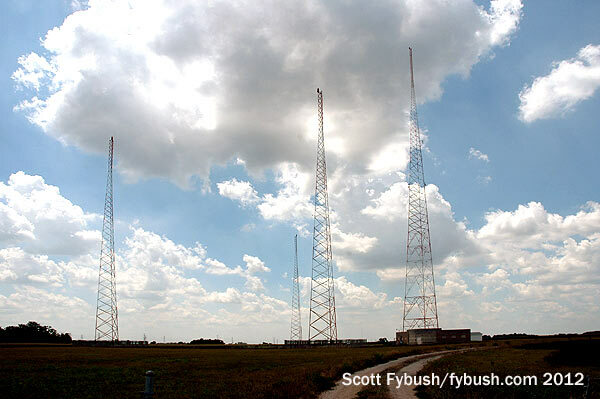 Go west on Muller and a little north on Cole Hollow Road and another tall tower is home to WTVP and to Bradley University’s NPR outlet, WCBU (89.9). 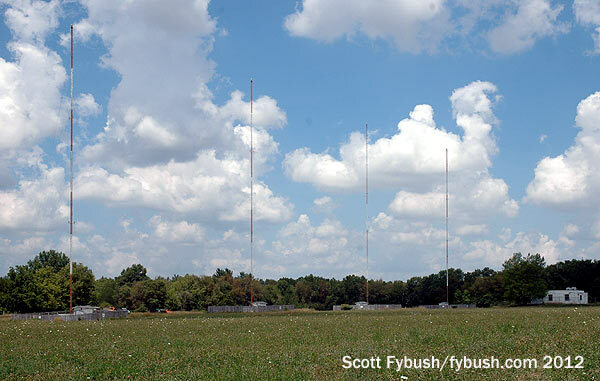 Just to the south of the TV/FM antenna farm, we find most of Peoria’s AMs. 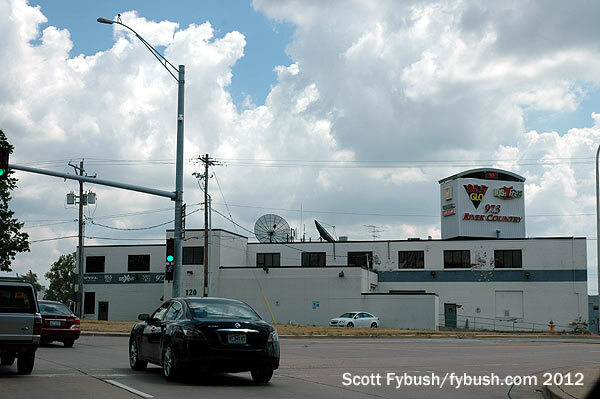 Go south on Cole Hollow and east on Zion Oaks Road and you’ll bend around the four-tower site of WIRL, which was Peoria’s monster top-40 AM back in the days when there were monster top-40 AMs. Wind through a residential area as you head southwest and you’ll come out in North Pekin along Edgewater Drive, where the tower of daytimer WVEL (1140) sits next to what I think was once its studio. The four towers of what’s now WOAM (1350) sit less than a mile to the southeast, down McDonough Park Drive south of Edgewater. This station has been through some tough times lately, including some silent periods, but in its glory days it was WEEK(AM), the station that spawned WEEK-TV. 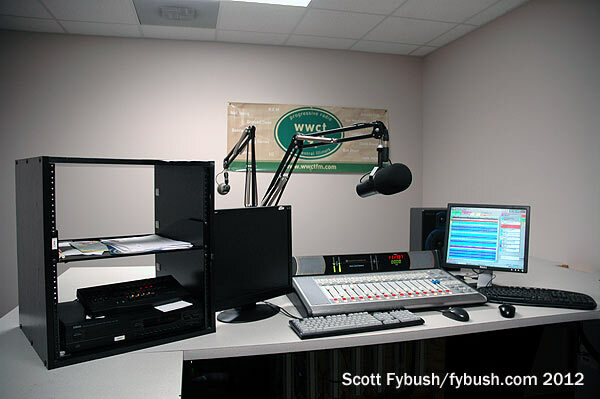 A later stint as country WXCL gave birth to today’s WXCL-FM on 104.9; these days, WOAM runs standards with 1000 watts day and night, three towers by day and all four at night. And the big gun in town sits way to the south down Springfield Road. 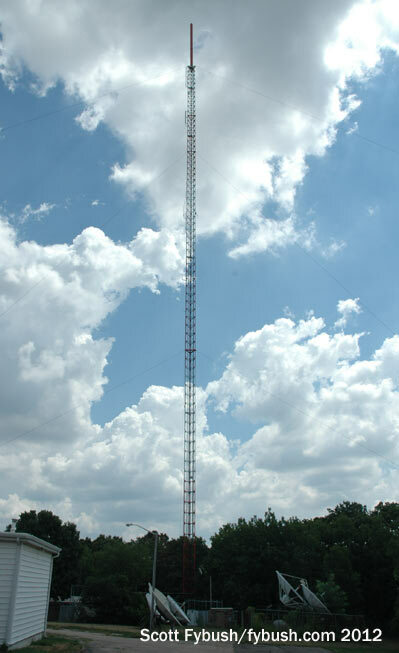 WMBD cranks out 5000 watts day and night from this site, with two towers by day and all four at night, dominating the 1470 spot on the dial across much of the midwest. 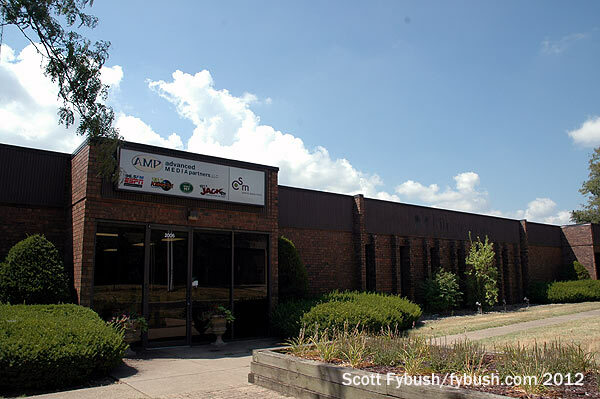 Thanks to Bob Swinehart and Scott Hecathorn at AMP Peoria for the tour! And don’t miss a big batch of Peoria IDs next Wednesday, over at our sister site, TopHour.com!